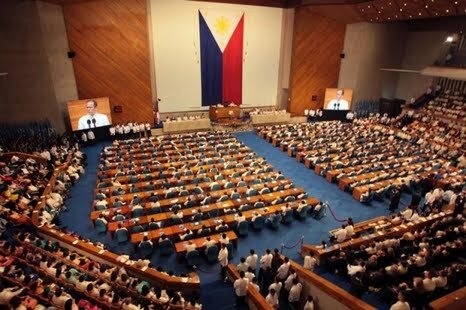 President Benigno "Noynoy" S. Aquino III on Monday, July 23, 2012, delivered his third annual State of the Nation's Address (SoNA) at the opening of the 3rd regular session of 15th Congress. SONA is an opportunity for the president to tackle country’s domestic and foreign situation and to chart a common direction that we should take to enhance efforts to achieve a better life for all. It is also an annual opportunity for crafting a framework that would address some disparities which hinder authentic development. It could also guide future legislation, development planning, and institutional reforms. President Noynoy reported the country’s status, unveil the government’s agenda for next year, and proposed to the Lower House and the Senate some legislative measures. President Aquino delivered the SONA Monday afternoon in front of his cabinet members, senators, and congressmen, with Senate President Juan Ponce Enrile and House Speaker Feliciano Belmonte Jr sitting behind him. Pnoy used the Tagalog language in his speech. This is good however for the Filipino people to understand fully his message. This is not the first time that he used our language. During his SONA, President Noynoy announced the achievements under his administration and provided some specific details, as well as the upcoming projects that he said will be completed before his term ends, in 2016. He also praised some of his cabinet members whose departments are performing well. PNoy received loud applause from the audience multiple times, which the loudest applause was when he gave a hint that he is supporting the controversial RH Bill (Reproductive Health Bill), which he said he believes that its approval will help a lot to improve the country’s economy. He also vowed to continue his stand to fight for the country’s ownership of Spratly Island and Scarborough Shoal; but noted that the there will be peaceful negotiations and his administration will do everything so that the nation’s relationship with China will not be affected. Senate President Juan Ponce Enrile; Speaker Feliciano Belmonte; Vice President Jejomar Binay; former Presidents Fidel Valdez Ramos and Joseph Ejercito Estrada; eminent Justices of the Supreme Court; distinguished members of the diplomatic corps; honorable members of the House of Representatives and of the Senate; our leaders in local government; members of our Cabinet; uniformed officers of the military and of the police; my fellow public servants;And to my Bosses, the Filipino people: a pleasant afternoon to all.